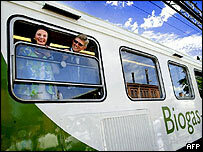 Sweden has unveiled an environmentally friendly biogas-powered passenger train - said to be the world's first. The train, fitted with two biogas bus engines, can carry up to 54 passengers, and will run on Sweden's east coast between Linkoeping and Vaestervik. Biogas, produced by decomposing organic material, emits far less carbon dioxide than traditional fossil fuels. The train can run for 600km (372 miles) before it needs to refuel and can reach 130km/h (80mph). Sweden already has 779 biogas buses and thousands of cars running on a mixture of petrol and either biogas or natural gas, the AFP news agency reports. The biogas train is due to go into service in September on the 80km (50-mile) coastal stretch. It cost Svensk Biogas 10 million kronor (1.08m euros; $1.3m) to develop.